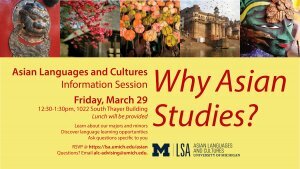 Current undergraduate students are invited to an information session on the Department of Asian Languages and Cultures major, minors, and language programs. Students will have the opportunity to speak with an advisor and ask questions specific to them. The Department of Asian Languages and Cultures (ALC) is a center for the exploration of the humanities of Asia, where students are invited to cross the boundaries of nations and of disciplines in order to develop two vital qualities: a deep knowledge and a broad global perspective. 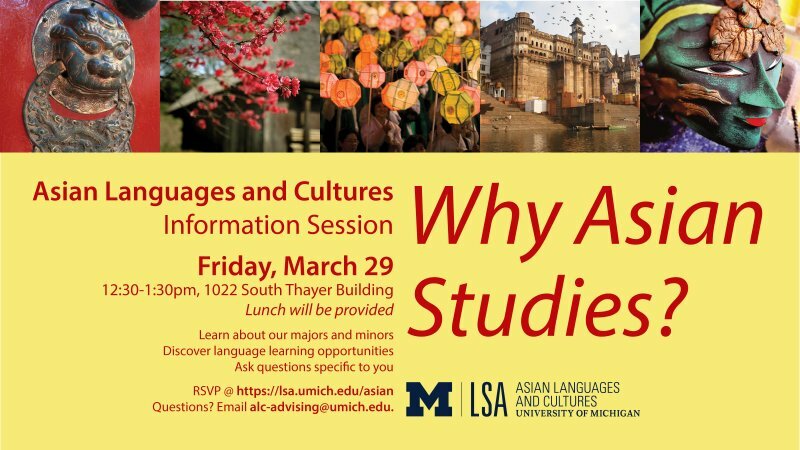 The department offers instruction in the cultures of South Asia, Southeast Asia, and East Asia, and in many of the languages of Asia (including Bengali, Chinese, Filipino, Hindi, Indonesian, Japanese, Javanese, Korean, Punjabi, Sanskrit, Thai, Tibetan, Urdu, and Vietnamese).